Do not let unkempt surroundings hinder your business' ability to profit. 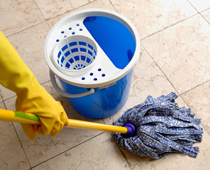 Hire our commercial cleaning company to keep your office organized and clean. Commercial cleanliness is always open for business with cleaning services from Eco Clean Maintenance. Our company makes your workspace shine at a price you can afford. Since we use eco-friendly products, you will feel good about having your business cleaned in a way that doesn't harm the environment or put your employees at risk! You also won't have to worry about high prices posing a risk to your bottom line—we offer reasonable rates and free estimates. Contact our janitorial service now to customize a maintenance program to your company's needs and budget. For 3 years, our company has been a popular choice for business owners wanting to provide their employees with a more appealing, sanitized workspace. Our 15 years of experience and use of "green" products and practices help set us apart from our competitors. Take advantage of our services to see why so many clients use us for their commercial cleaning needs. Call us today at (877) 463-2601 for a cleaning proposal you can afford.